Los Cabos, one of Mexico’s premier resort destinations, welcomed several new hotels and resorts to the impressive collection of existing properties in 2009. From a family-friendly, all-inclusive property in sleepy San Jose del Cabo to a stunning, upscale property built into the dramatic mountainside in Cabo San Lucas, these new hotel options further solidify Los Cabos’ position as one of the world’s most diverse and sought after vacation destinations. Located just 10 minutes from the picturesque town of San Jose del Cabo, the magnificent Barcelo Los Cabos Palace Deluxe features 626 luxurious guestrooms and suites from 1,125 to 2,168 sq. ft. The all-inclusive, all-suite resort opened in December 2009 and features 34 unique swim-up suites, the first and only ones of its kind in the destination. Designed in the California hacienda style, the Barcelo Los Cabos stylishly blends classic Mexican charm with modern, luxurious amenities, including three pools totaling more than 50,000 sq. ft, a children-only water park and world class, 18,000 sq. ft. spa with 16 private treatment cabins and a hydrotherapy room. 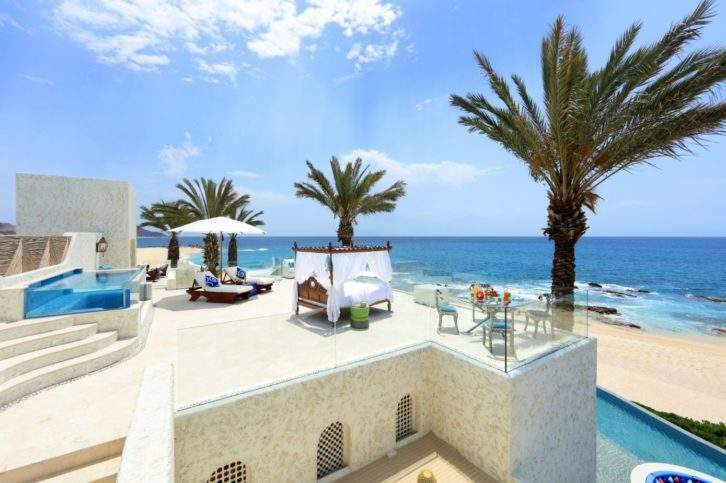 At the opposite end of the spectrum is the stunning 32-suite hacienda-style, beachfront boutique hotel, Zoëtry Casa del Mar. This exquisite resort was designed perfectly to provide guests with stunning sunset views unlike any other property in the area. Zoëtry Casa del Mar, officially opened on December 1, 2009, features exceptionally large oceanfront suites with Jacuzzis, Rivolta bedding and private balconies, gourmet dining, multiple tennis courts, and access to the championship 18-hole Robert Trent Jones Jr., Cabo Real Golf Course. In July 2009, “Land’s End” welcomed the stunning Capella Pedregal, a 66-room top-tier hotel and residence resort located along the Cabo San Lucas Marina with breath-taking views of the Sea of Cortes and the Pacific Ocean alike. As one of Los Cabos’ premiere resorts, Capella Pedregal encompasses 24 acres of dramatic mountainside and oceanfront property, offering guests an impressive view of the very point where the Pacific Ocean meets the Sea of Cortes. This stunning property serves as the flagship luxury beach resort of the newly unveiled Capella brand and is comprised additional of 31 shared-ownership Capella Residences and 20 private, full-ownership Capella Casonas. The resort additionally features an Auriga spa, the compelling new spa brand from world-renowned spa designer Sylvia Sepielli. In 2010, a new property will join the Los Cabos Hotel Association. Sierna del Mar Los Cabos, a Welk Resort, is a luxurious 7-acre resort perched on the cliffs above Cabos San Lucas, offering a spectacular view of El Arco. Each villa has a direct ocean front view and from December through March, whales can be seen from villas, the pool and the beach of Sierna del Mar Los Cabos. Conveniently located in the heart of downtown Cabo San Lucas, the resort offers guests an exclusive hideaway only minutes away from incredible restaurants and a lively nightlife. Coming to Los Cabos in 2011 is the newest venture from Solmar Hotels & Resorts, the Grand Solmar Land’s End Resort & Spa. This resort aims to set a new standard of luxury in Cabo San Lucas and will feature old world architecture carefully crafted with a modern style and grace.